Israeli Sephardic Chief Rabbi accepts an invitation to visit Istanbul-based theologian Adnan Oktar in hopes of restoring diplomatic ties. Israeli Sephardic Chief Rabbi Shlomo Moshe Amar has accepted an invitation to Turkey for interfaith talks aimed at defusing tensions between the two nations. 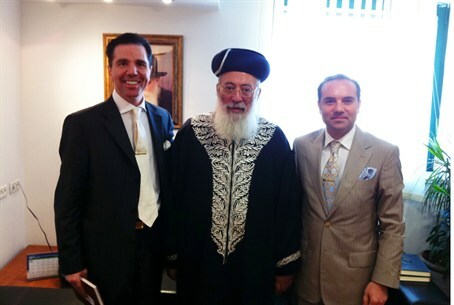 The Rishon Lezion agreed Wednesday to travel to Istanbul as a guest of Turkish theologian and philosopher Adnan Oktar. No date for the trip has been set. The two envoys, who arrived in Israel on Sunday, met earlier in the week with Deputy Prime Minister Eli Yishai, chairman of the Sephardic religious Shas party. Yishai was also invited for talks with Adnan Oktar in Turkey, and according to Babuna, is considering the offer. During their talks with Yishai, the two emissaries said the Mavi Marmara flotilla clash in May 2010 was responsible for much of the current tension between Jerusalem and Ankara. The Shas minister wanted to know if he would be asked to apologize on behalf of the Israeli government for the deaths of nine Turkish IHH terror activists on the vessel who were killed during their attack on IDF navy commandos. The Ankara government has demanded that Israel apologize for the deaths, compensate the families and dismantle its blockade, which was created to prevent the smuggling of weapons by terrorists into Gaza. Israel has expressed regret and offered to compensate the families but refuses to apologize for killing armed terrorists who attacked first, and who were carrying no humanitarian aid on their ship. Yishai will not be asked or expected to apologize, Arutz Sheva was told. However, Oktar made it clear in his response to Arutz Sheva that he believes it is in Israel's best interest to issue an apology. “I cannot decide on behalf of the Israel nation, of course. But my personal opinion is that an apology should be made. Apology is a reasonable act; it is courtesy, a beauty. It is not something degrading, not a humiliation. It is a graceful attitude. We recommend the apology and compensation so as to calm the tension and at least balance matters. “But this is our belief... Ultimately something to make up for the situation needs to be done,” he said. “However Israel decides regarding the apology, we believe that the visit to Istanbul and having meetings with the Chief Rabbi Shlomo Amar and Interior Minister Eli Yishai here will help to reduce the tension. Knesset Speaker Reuven Rivlin, Likud faction head Ze'ev Elkin, MK Nissim Ze'ev and a number of other high-level officials also met with the two envoys, who are set to return to Istanbul at the end of the week.